I think they turned out adorable and I hope you do too! 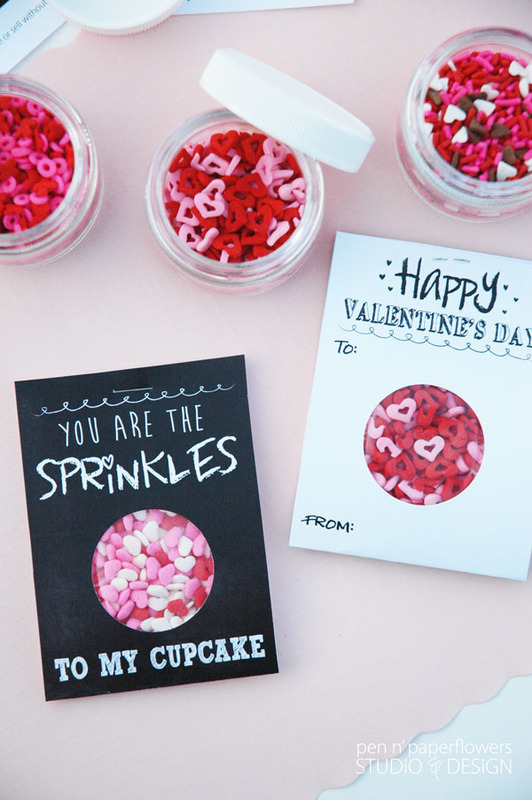 Download these adorable Valentine's Day cards HERE! 1. 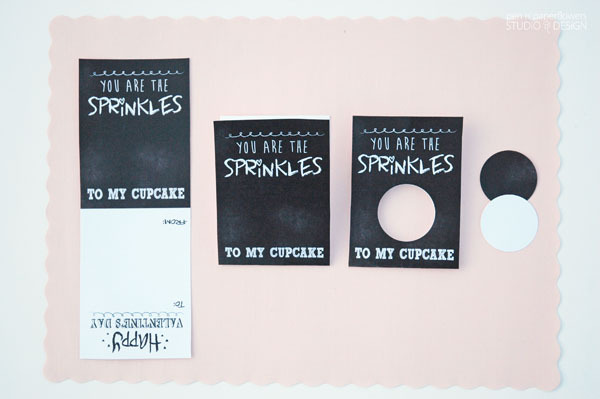 Print Cards onto white card stock. 2. Trim to size using scissors or a paper trimmer. 4. 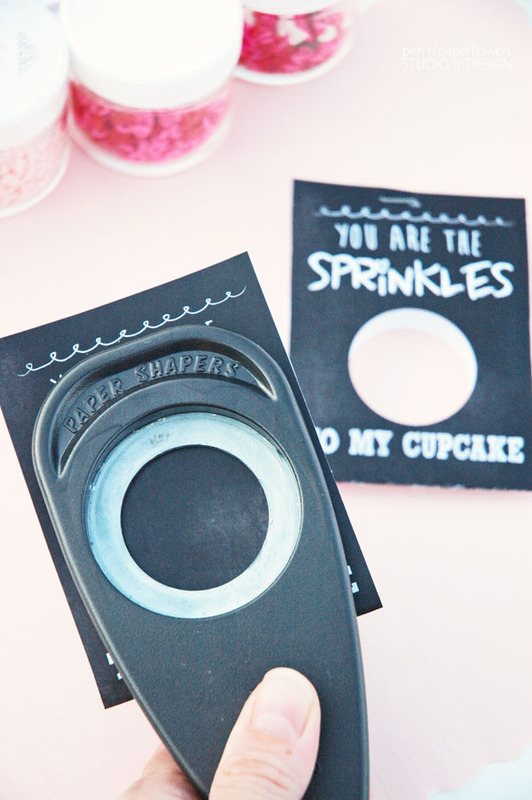 Use a 1.5″ Round Craft Punch to create a circle through the middle of the folded card. 5. 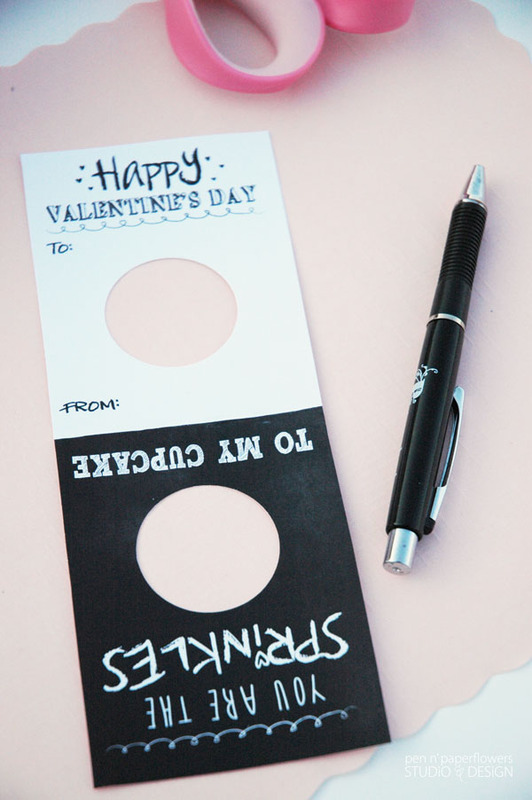 Unfold card and have your child (or yourself) fill it out with a fine-tip sharpie or pen. 6. 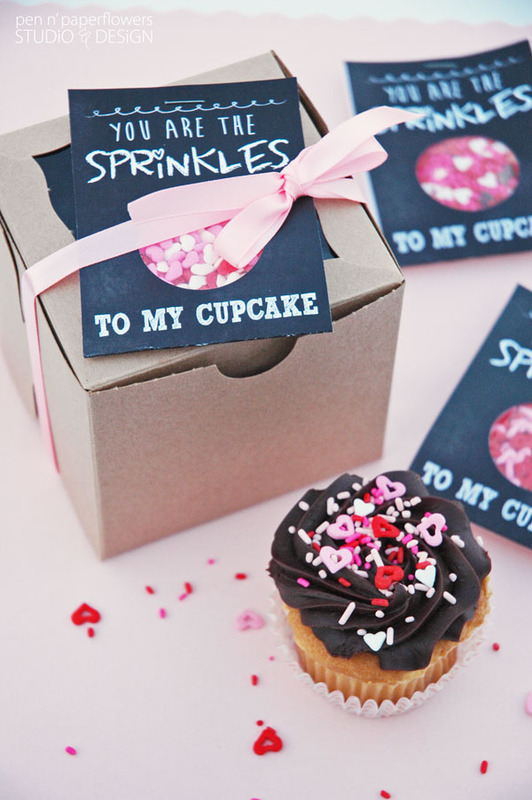 Fill a mini ziploc bag a little more than 1/2 full with sprinkles of your choice. 7. 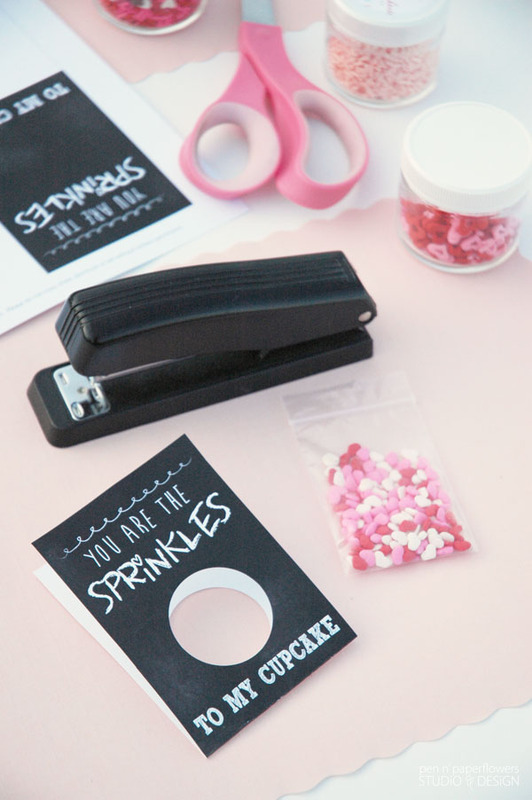 Refold card and slide the mini ziploc bag filled with sprinkles in between both sides of the card. 8. 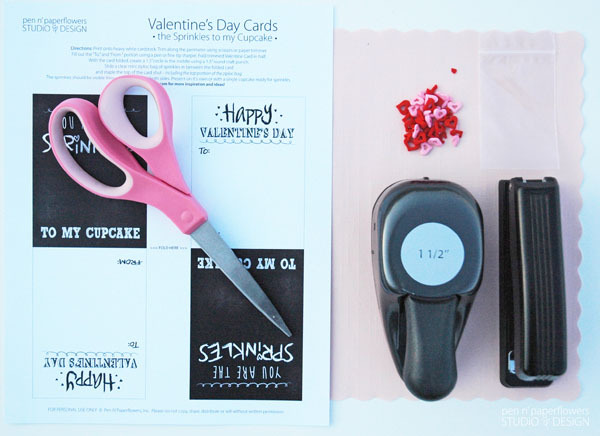 Staple the card closed – being sure the staple penetrates through the top of the mini ziploc bag. Check out all of the other creative ideas submitted by so many other talented designers over on Skip to My Lou! A super huge thanks to Cindy over at Skip to My Lou for inviting me to participate! Ella started her first day of preschool yesterday. I'm totally using these for the classroom Valentine's Party tomorrow. I'm a little hesitant since it'll only be her 3rd day there and I'm not sure I'm ready to be labeled as "THAT mom" - if you know what I mean? But I did get to send one home with her sweet little friend, Elise, after their "Friendship Party" we had at our house yesterday. All of the sweet details coming soon. Hello! I love this card and want to make them but when I went to get the bags in that size they were craft bags and said do not use for food. What bags did you use? Thanks for your comment - The bags I used were from the jewelry making/craft section. There's nothing on mine about them not being food safe but if you are worried about it then absolutely don't use them. If I were going to heat them up in the microwave I'd probably be concerned about using them with food. I'm not sure if that helps or not? Let me know what you end up doing. You could always wrap them in saran instead. Not as cute but it would still work. 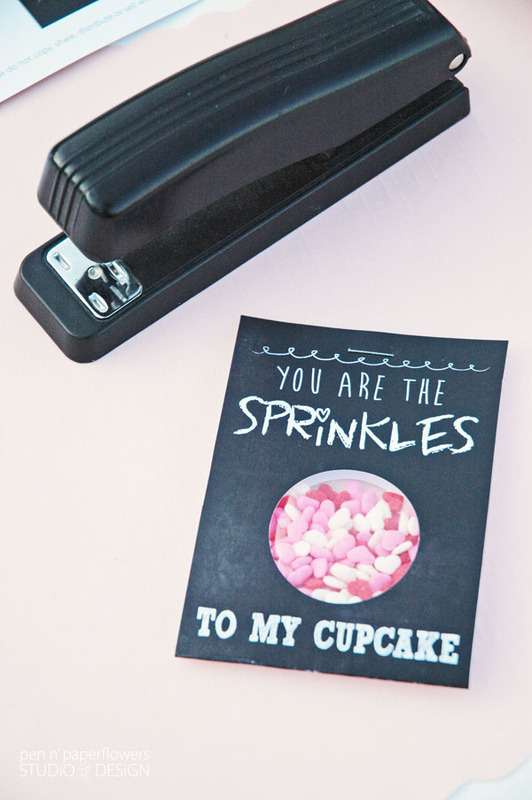 Where did you purchase your hole punch? I bought mine at Hobby Lobby, I purchased the 1.5 medium and it cuts of some of the lettering. HELP!!!!!!!! !